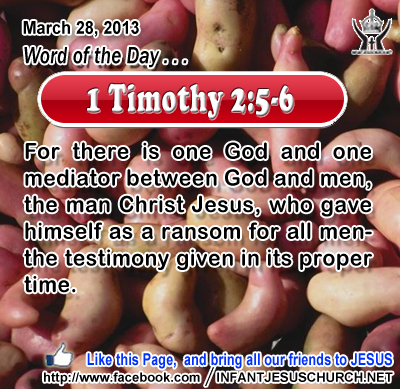 1 Timothy 2:5-6: For there is one God and one mediator between God and men, the man Christ Jesus, who gave himself as a ransom for all men- the testimony given in its proper time. Heavenly Father, you are our God, and we praise you for making access to you so freely availawble. We know that if left to our own power, we would have no strength or righteous with which to approach you. Yet in your grace, you not only provided a ransom for our sin, but you also provided a mediator for our approach to you. Jesus, we thank you as well, for paying the price and staying at the Father's side to intercede and speak for us! Thank you, Infant Jesus, for making this prayer known to the Heavenly Father as we pray in your name. Amen. 1Now before the feast of the Passover, when Jesus knew that his hour had come to depart out of this world to the Father, having loved his own who were in the world, he loved them to the end. 2 And during supper, when the devil had already put it into the heart of Judas Iscariot, Simon's son, to betray him, 3 Jesus, knowing that the Father had given all things into his hands, and that he had come from God and was going to God, 4 rose from supper, laid aside his garments, and girded himself with a towel. 5 Then he poured water into a basin, and began to wash the disciples' feet, and to wipe them with the towel with which he was girded. 6 He came to Simon Peter; and Peter said to him, "Lord, do you wash my feet?" 7 Jesus answered him, "What I am doing you do not know now, but afterward you will understand." 8 Peter said to him, "You shall never wash my feet." Jesus answered him, "If I do not wash you, you have no part in me." 9 Simon Peter said to him, "Lord, not my feet only but also my hands and my head!" 10 Jesus said to him, "He who has bathed does not need to wash, except for his feet, but he is clean all over; and you are clean, but not every one of you." 11 For he knew who was to betray him; that was why he said, "You are not all clean." 12 When he had washed their feet, and taken his garments, and resumed his place, he said to them, "Do you know what I have done to you? 13 You call me Teacher and Lord; and you are right, for so I am. 14 If I then, your Lord and Teacher, have washed your feet, you also ought to wash one another's feet. 15 For I have given you an example, that you also should do as I have done to you. Jesus' hour of humiliation draws near and he reveals to his disciples the supreme humbleness which shaped the love he had for them. He stoops to carry out a menial task reserved for servants - the washing of smelly, dirty feet. In stooping to serve his disciples Jesus knew he would be betrayed by one of them and that the rest would discard him through disloyalty. Such knowledge could have easily led to resentment or hatred. Jesus met the injury of betrayal and disloyalty with the greatest humbleness and supreme love. Jesus loved his disciples to the very end, even when they failed him and forsook him. The Lord loves each of us totally. His love has power to set us free to serve others with Christ-like compassion and humility. Does the love of Christ rule in our heart, thoughts, intentions and actions? Loving Infant Jesus, your love conquers all and never fails. Help us to love others freely, with heart-felt compassion, kindness and goodness. Where there is injury, may we sow peace rather than strife.